Lenovo knows a good smart assistant when it sees one. The company was one of the first to team with Google on a third-party smart display, and now it’s getting in on the ground floor for Alexa tablets. The company just announced two devices — the Smart Tab M10 and P10. Both are 10.1-inch tablets that are among the first non-Amazon Fire tablets to sport the smart assistant. The devices ship with the company’s new Smart Dock, which toggles the slates into Show Mode, so they can effectively double as Echo Shows while charging. The dock/stand has three-watt speakers and three built-in microphones listening for Alexa commands. Lenovo’s positioning this as a kind of travel Echo Show, which is an interesting take on the category. 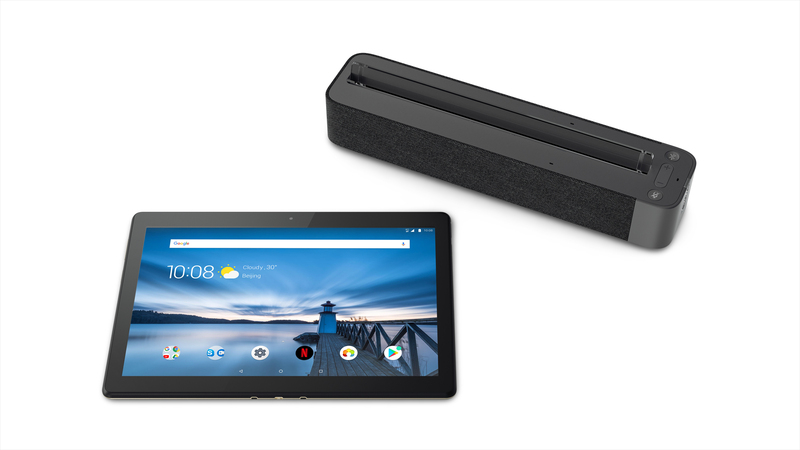 The dock itself isn’t small, but the whole setup is certainly more portable than attempting to slip a smart speaker in your bag. I’m not sure how much of a demand there is for such a thing, but I know at least one TechCrunch staffer who goes through smart speaker withdrawals when he’s on the road, so maybe there’s something to be said for it, after all. As for the tablets themselves, the primary difference between the two is design language. The P10 is the slicker, thinner and lighter of the two models. It also sports more RAM (4GB), more storage (up to 64GB) and a beefy 7,000mAh battery. At $300, it’s also a full $100 more than the M10. Both will be arriving this month.